She does not know it yet but Clotilde is really the one who initiated this story. Her curiosity triggered mine. After commenting on my last post about my lucky encounter with Jeff, she asked whether I knew what the cookies on the last picture was. Curious by nature, I immediately emailed Jeff’s producer. Janice emailed me right back, to let me know that the picture was in fact part of a cookbook that Jeff did the photography for: Chocolate and Vanilla by Chef Gale Gand. 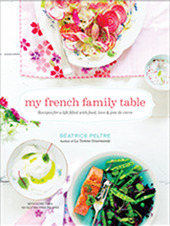 I was thrilled to have an answer for Clotilde, but even before I had time to tell her, she herself emailed me a recipe. What are the odds of this, I may ask you? Aren’t we, food bloggers, amazing researchers when it comes to expressing our passion for food? I told Clotilde that I was going to try. Not even letting one day go by, I pulled all the ingredients needed to prepare the cookie dough. It was extremely easy to work, but needed to be chilled for 3 hours. Then, that same afternoon, we drove to Sur la Table to purchase a few cooking gadgets — I am now in serious trouble with P. — and a cake mold that needed to be replaced. I did not look for it but to my delight, I spotted the Chocolate and Vanilla cookbook Janice had told me about. 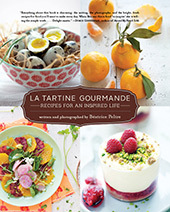 Trying not to look too greedy in front of the other clients browsing around in the store, I was nevertheless quick to grab the book; I started to flip through the pages, curious again to see whether it included the recipe Clotilde had sent me. There they were both: Jeff’s lovely and fresh picture, and the exact same recipe for Mary’s Butterballs. Clotilde had found the right one indeed. A butterball. What a funny name! I had never heard that word prior to my conversation with Clotilde. Feeling curious again, I searched its meaning. According to Answers.com, a butterball is informal, and means “a chubby or fat person”. It is also the name of a food company selling turkeys. Not related to cookies at all, I can guarantee you that part. Mary’s butterballs cookies are surprisingly extremely simple to prepare, and buttery as suggested by their name. 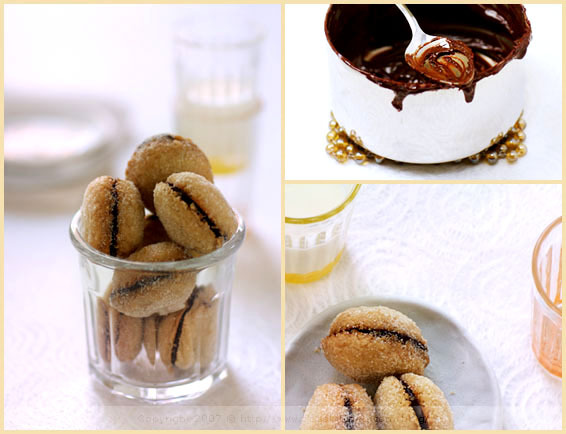 Flour, sugar and a lot of butter are used for the cookie dough, jam or dark chocolate ganache is used for the filling. You need an even number of balls since the cookies are then sandwiched together. I am not sure whether it was due to my oven, but I somewhat had to increase the cooking time by a few minutes, for the cookies to be properly cooked. My little balls also did not rise as much as I thought they would, but then, this was also partially my fault as I rushed the recipe, and did not work the butter as long as advised. All in all though, the cookies were nice, fun to make — I particularly enjoyed the rolling part — and “buttery“, as our friend J. pointed out after he tried one from the bag of goodies I brought to his house on Sunday. Seriously, this is what you get when you put the picture of scrumptious-looking sugary cookies in front of two curious female food bloggers. I don’t think that you will mind, will you? In a mixer fitted with a whisk attachment, beat the butter until it becomes light (3 to 5 minutes). Mix in the sugar, and when the dough is homogeneous, add the flour. Mix until it forms a ball. Wrap it in plastic and chill for at least 3 hours. This will help to prevent the cookies from flattening out too much when they are baked. Take off pieces of dough with your hands, and roll small (3/4 inch) balls of dough between the palms of your hands. Chill them for 30 minutes in the freezer, then place them 2 inches apart on a cookie sheet, to allow for them to spread. Bake the balls for 13 to 15 min, or until the cookies are firm but not browned. Remove them from the oven, and let them cool on the cookie sheet. Spread the flat face of half of the cooled cookies with the ganache, and top with a second cookie to form a little sandwiched ball. 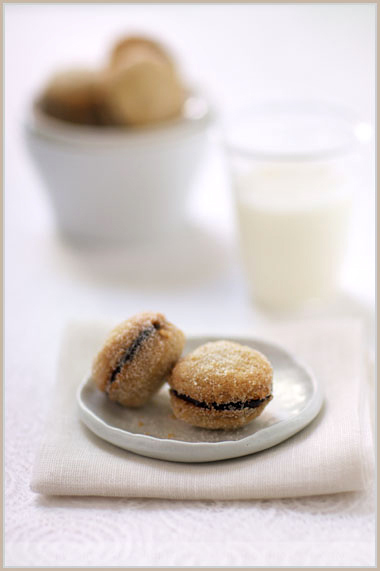 Once the chocolate filling is firmer, roll them in the vanilla-flavored sugar, to coat them entirely. Dans un mixeur à pied, travaillez le beurre en pommade jusqu’à ce qu’il soit bien aéré (3 à 5 min). Ajoutez le sucre et une fois que la préparation est homogène, ajoutez la farine de manière à obtenir une boule. Enveloppez-la dans du cellophane et mettez-la au frigidaire pendant au moins 3 heures (cela permet aux cookies de ne pas s’étaler lors de la cuisson). Préchauffez votre four à 190 C.
Détachez un morceau de pâte de la boule et formez des petites boules de 2 cm en roulant la pâte entre la paume de vos mains. Placez-les au congélateur pendant 30 minutes. Mettez-les ensuite sur une plaque de cuisson recouverte de papier sulfurisé, espacées de 5 cm. Faites cuire pendant 13 à 15 minutes, jusqu’à ce que les cookies soient fermes, mais ne brunissent pas. Retirez-les du four, et laissez-les refroidir sur la plaque. Préparez une ganache au chocolat et étalez-en un peu sur un cookie. Prenez un deuxième que vous posez dessus, comme pour former un petit sandwich. Une fois que le chocolat a un peu durci, roulez les cookies dans le sucre vanillé pour recouvrir tous les côtés. ce doit être contagieux cette curiosité… elle me titille depuis l’instant où j’ai vu la bonne tête de ces sablés billes et quand je vois le poids de beurre… je sens d’ici qu’ils portent effectivement bien leur nom! Je suis très friande de ce genre de petites gourmandises et avec les fêtes de fin d’année qui approchent et les préparatifs des paniers gourmands, ta recette tombe à pic ! Quelle rapiditié ! Merci pour le clin d’oeil, et merci d’avoir testé pour nous ! I like the fact that often our researches for recipes sounds like plots for some kind of “quest” from the novel… this yours, I do not know way, recalled “The Name of the Rose” by Umberto Eco! Wow! Do I remember reading about googling images? How would you find that? Well, anyway the cookies and the cookbook have made my list! Now, I need some cookie baking time. toujours un plaisir de venir par ici. Bea, what a sweet/funk (you choose) name indeed. Elles sont vraiment trop mignones; toutes chubby et vont directement sur ma to-make list. I also wondered what those cookies were in the photo, thanks for finding the recipe and putting it up. I love Gale Gand, every time I’ve tried one of her recipes, it’s always great, I’m going to put these on the Christmas cookie list. Encore un truc a ne pas mettre sous tous les yeux. Anything in the name of sugar!! Love it :). These look delicious! oooh…those butterball cookies and macarons look like cousins. Beautiful photography as usual, Bea! Did you ever find the online video on these…a small world the net is. Especially since someone in Mumbai asked if I could supply his private plane with Laduree Paris macarons!!! I think I just found something new for my Christmas baking list. They look beatiful! I love that they’re called butterballs and they’re such a nice round shape! It’s a perfect name for them. I also love your story of food curiousity. I know that feeling so well– as soon as I encounter something that interests me, I MUST know all about it immediately. In Italy it calls BACI DI DAMA!!! Ces petits sablés me tentent mais tremper mon doigt dans la casserole… aussi ! Avec du thé, je ne peux pas dire non. C’est crac de plaisir. Et tout ce qui est petit, est forcément bon. Those butterballs look amazing. I’m glad there are curious food bloggers out there! These look delicious, and as always, you make food look so beautiful. I own this cookbook and know the glory of Mary’s Butterballs! They’re spectacular! No I don’t think we mind at all! I will try these soon, they look like a great addition to my Christmas cookie repertoire. Thank you and as always– so beautiful. Yummy … je vais m’entrainer pour Thanksgiving pour etre sur qu’ils seront reussis a Noel ! Un sandwich de sablés au chocolat, comment résister même de bon matin? moi je veux etre ta voisine, ta cousine, ta copine, ta soeur,ta belle-soeur, ta niece, enfin n’importe quoi mais etre proche pr pouvoir gouter tout ca !! !! What a fun story about how this recipe came to you! I admit, the photos absolutely beg for an accompanying recipe. I already have planned too many cookies to bake for the Christmas season, and now I want to add these too. What am I to do! I was going to make those in September for a friend’s birthday since they sounded so simple to make, but time got away from me and I went to bed instead. Now you’ve resparked my curiosity to try them. So great!! Des mignardises à fondre de plaisir!! Très beau site, Bravo!